Home Engineering Entrance Exams BITSAT BITSAT 2019 Admit Card Released- Download Here!! 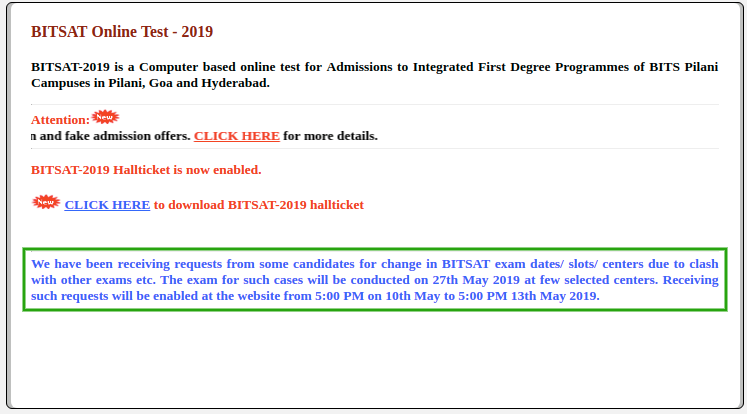 BITSAT 2019 Admit Card: Candidates who want to make changes in the exam slot/date/centre will be able to do so from 10th May 2019 to 13th May 2019. The admit card has been released on 12th April 2019. The link to download the admit card is available on this page. Check the procedure to download BITSAT admit card here. You can download the admit card of BITSAT 2019 till 13th May 2019 after it has been released. The download link of admit card is given in this article. Details mentioned on the BITSAT 2019 Hall ticket have been listed in this article. Key features of admit card of BITSAT 2019 are listed in this article. Admit card is a crucial document to take the BITS exam of 2019. BITSAT is one of the most reputed institutions that the candidate take admission to. It is only a one time chance to take the exam for this year therefore, candidates must make sure that they carry their BITSAT admit card 2019 to the exam center. Candidates failing to carry it to BITSAT test centre will not be allowed to appear for entrance exam. Apart from this, BITSAT 2019 admit card will also be required during the counselling process. Therefore, candidates need to keep it safe till the admission process gets over. BITS Admission Board is receiving requests from some candidates for change in BITSAT exam dates/ slots/ centers due to clash with other exams etc. The exam for such cases will be conducted on 27th May 2019 at a few selected centers. The link to make changes will be live at the website from 5:00 PM on 10th May to 5:00 PM 13th May 2019. The admit card is available for download. BITSAT 2019 Slot Booking has started from 5th of April 2019 onwards. BITSAT Admit card 2019 has been issued by the exam conducting authority which is BITS, Pilani. Birla Institute of Technology and Science Admission Test (BITSAT) 2019 will be conducted from 16th May – 26th May 2019 by BITS Pilani. BITSAT is a University level examination conducted for admission to undergraduate degree courses offered at the three campuses of BITS i.e Pilaf, Goa and Hyderabad. All the aspiring candidates who want to pursue Bachelors in Technology programmes in the reputed institutes of BITS will be required to qualify the BITSAT 2019. To appear in BITSAT 2019, candidates must carry the hall ticket that has been issued for all eligible candidates. Get the full information about BITSAT Hall Ticket 2019 in this article. Candidates must mark the below-given dates on their calendar. The BITSAT 2019 Admit Card is available from 12 April to 13 May 2019. The hall ticket which is also known as the admit card is one of the most important documents that the candidate must carry to the exam center on the day of the exam. Without the admit card, candidates will not be allowed to take the examination. BITSAT 2019 Hall ticket will act as a proof of identity of the candidate and will carry important information like the name of the candidate, the details of examination center like the name and address, the exam date and timing, the photograph and signature of the candidate, etc. Applicants must mandatorily carry the exam hall ticket and must preserve it even after the BITSAT 2019 examination is over. To download BITSAT Hall Ticket 2019 candidates must follow the steps given below. The admit card will be available only on the official website. Go to the official website of BITSAT or click on the link available below. The BITSAT 2019 Admit Card will be displayed on the screen. Candidates must check that their BITSAT Hall ticket 2019 carries all the details listed below. Candidates will be required to carry the Admit card to the exam hall as without the hall ticket, candidates will not be allowed to take BITSAT 2019. The candidate must show the hall ticket to the invigilator. The Invigilator will check all the details on the admit card and if found incorrect, he/she will be barred from taking the examination. In case of any discrepancy in the BITSAT 2019 Hall ticket, the candidate must approach the concerned authority and get the mistakes rectified. Candidates will be required to preserve the admit card until all the admission process is over. The admit card must not be tampered or mutilated in any way whatsoever. After taking a printout of the admit card, sign it. Affix a photograph to the designated space after duly getting it attested by the head of an institution or gazetted officer. Carry one identity proof along with the BITSAT 2019 Admit Card. BITSAT Admit Card 2019 is one of the crucial documents to be carried along by the student on the day of the exam. Candidates will be informed as soon as the admit card of BITSAT 2019 is released. 3 How to download the BITSAT 2019 Admit Card?